by Dee Braun | Dec 17, 2018 | Dinner, Extra Healthy! Not only is this recipe extremely delicious, it’s exceptionally healthy. Loaded with anti-inflammatory omega-3 fatty acids, the combination of fresh walnuts and wild-caught salmon is truly life giving! Blend walnuts in a food processor in until finely chopped. In a separate bowl, mix walnuts with maple syrup, Bragg’s Aminos, salt and pepper. 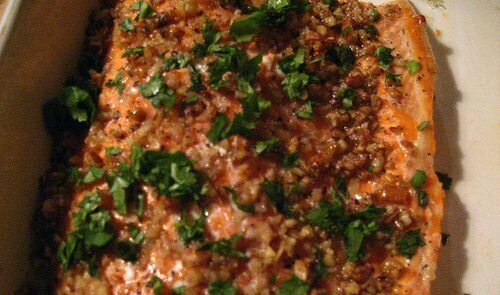 Apply walnut mixture on top and on the sides of the salmon evenly. Place salmon on greased baking dish. Bake for 10 minutes or until fully cooked. Served with organic, non-GMO basmati rice and some steamed asparagus for a delightful entrée. Scientists have established the effectiveness of Omega 3 in a number of health areas, including your Heart, Brain, Joints, Skin, Immune system, Vision, and Digestion. Like any product on the market today there are ‘good fish oils’ and there are ‘bad fish oils’! With a bad one you may be unwittingly introducing substances into your body that you DO NOT want… such as Mercury and PCB’s for example. We impose tougher standards on the purity of our fish oil than any other known manufacturer. Learn more about Xtend-Life's Omega-3 QH Ultra now.